Body pillows are roundly purchased for expecting mothers to help them rest comfortably (Source). The J, C, U and full-length shapes can help achieve comfortable side resting positions. There are a variety of sleeping positions both women (and men!) can can try- hugging a long side, lying cradled in its interior, with knees gripping the pillow leg to help relieve painful lower-back pressure (Source). These 'hug' pillows are a must when pregnant women are trying to avoid sleeping on her back, if they believe it helps enhance blood flow to the womb (Source). Body pillows can also potentially help alleviate snoring, 'restless' sleeping, acid reflux, as well as reduce back, hip and neck pain by re-aligning your sleep posture for a more hygienic night's rest (Source). There are some different shape options available- basically they differ by how much of an enclosure is created by the pillow- ranging from totally straight (full-length) to almost completely enclosed (C-shaped and U-shaped). C-shaped body pillows​ are commonly the lowest-priced option. These full pillows support head and shoulders the most at the top of its C-shape, with 'long ends' that help support the legs at the bottom of the C and space for the pregnant belly in the opening (Source). U-shaped body pillows ​provide a cradled nest to rest in, supporting both the back and belly simultaneously. Many believe it's the best option for pregnant women because it offers support to the back and the belly at the same time (Source). It enables women to sleep on either side while her head is supported, which also helps with heart burn. Full-length body pillows​ provides complete body support from sleeper's toe to the head. You'l find them between five to six feet in length. Most commonly, you'll be able to wrap it around the body for maximum comfort (Source). This C-shaped contoured maternity pillow features a zippered, removable pillowcase and is designed to help alleviate pain related to sciatic, back pain, heartburn as well as carpal tunnel syndrome. The Moonlight Slumber Total Body Support Pillow is a U-shaped design intended to help you stretch out while simultaneously supporting either side of your body. It is filled with a proprietary fiber called Fusion Foss that the manufacturers claim enable it to better circulate air and remain permanently soft and fluffy. 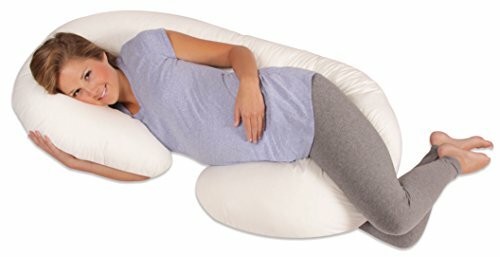 This is a somewhat more expensive pillow, but many users comment that it helps them, particularly when they were not side sleepers already, to sleep on their side when they are pregnant. When pregnant women sleep, doctors often advise that they can lie halfway on their back, as long as they have pillows they keep them propped up at an angle. The Leacho Snoogle Body Pillow was designed by a registered nurse and mother. Explicitly designed to replace the multiple pillows people use to find a comfortable sleeping position, the body pillow is engineered to adhere to the natural shape and contour of the human body. Some users comment that their pregnant wives can now sleep soundly, contributing greatly to marital harmony. Husbands describe going to bed with their pregnant wives who only sleep fitfully, constantly waking them up because they can’t find their own comfortable sleeping position. An interesting and underreported benefit of these pillows is that as pregnant women’s bodies change over time, these pillows are capable of adapting to their altering shape. Some people claim that removing the case of the pillow can be aggravating, but this is really the only significant drawback that we’ve seen with this particular model, as well as the others that we have reviewed above. When the pillow is inserted between the knees it will help to align the spine and this is often a great relief for those who suffer from sciatica or disc herniations. Body pillows also promote muscle relaxation. Whenever the spine is correctly aligned and your leg and arm weight is equally divided, your body breathes better and your blood circulation is enhanced, helping you to relax throughout the entire night. Before you decide on a particular body pillow, make sure to consider its size, its shape as well as the materials it’s made from. Many body pillows have an oversized ‘U’ shape, but others have a ‘J’ shape that resembles a candy cane that you might place on a Christmas tree, while others have more of a rectangular shape to them. The first contoured body pregnancy pillow we examined was the J-shaped option by Web Linens-it comes in white ivory burgundy and gray. It's designed to help relieve the carpal tunnel, heartburn, sciatica, nasal congestion, all while supporting the stomach and back. As well, it's marketed towards expectant mothers- because this J-shaped pillow helps to cushion and support the back, easily tucking between the legs, it can be a comfortable way for pregnant women to sleep while cradling their bellies. This is a Chinese-made a pillow, with one reviewer who enjoys sleeping with three or more pillows for his ankles, knees, and head deciding to consolidate by purchasing this large and uniquely shaped option. He told us that it replaces all the pillows he was using before, saying that it doesn't take up as much space and the removable zip off washable cover makes it easy to toss in the washing machine when needed. Another reviewer told us that he was pleasantly surprised at how comfortable it is to use this J-shaped body pillow to sleep on his back, both his right and left sides, all while the pillow stays in place without moving. Another reviewer told us they purchased it to help keep them from rolling onto their back and sleeping at night- this was important for this pregnant woman because they believed that sleeping on the back deprives the in utero child of blood flow. It easily fit her king-size bed, with the only downside being that it prevents cuddling with your partner. The second oversized down body pillow we examined is also manufactured by Web Linens- it is the oversized maternity pillow. This is not a curved hug pillow- instead, it is fully straight, a really long body pillow. Reviewers say that this is a great body pillow for tall people, with one buyer who stands over 6 foot 3 saying that it is a great fit for him. Unfortunately, reviewers have provided some mixed feedback, with one buyer telling us that it caused her headaches, which she blames on the fact that it doesn't completely conform to her body. In actuality, it's rather too crunchy and solid to feel comfortable sleeping with. However, some people are happy with it, saying that at 90 inches long it's great for tall individuals who like the springy filling material, which isn't exactly soft and doesn't hold the form over its 30-inch circumference. The third body support pillow we examined is the Moonlight Slumber option- it is a U-shaped pillow, designed for sleepers to comfortably stretch out while supporting both sides of the body. One of the benefits, the company says, is that it effectively cradles the body during rest, which decreases the incidence of turning and tossing, helping to keep your hips, shoulders, back and neck comfortably aligned for a complete night's rest. In addition, it's filled with what is called a Fusion Fiber- the manufacturers refer to it as a hypoallergenic fluffy and soft polyester polymer that is clump and lump resistant. While incredibly comfortable, on the downside since it is so large it's difficult to store, and if you like to make your bed up neat in the morning, this oversized U-shaped body pillow is hard to hide. Another buyer purchased it to help him with his acid reflux and snoring issues. Because of several shoulder injuries he had grown accustomed to sleeping on his back which exacerbated the acid reflux and the snoring- with this full hugger pillow he's now able to comfortably sleep on either his right or left side, decreasing his acid reflux and snoring. While expensive, most people who took the plunge and purchased it told us that they are satisfied with it- one hip pain sufferer says that it's been the best means of decreasing the chronic pain in her hips that she has experimented with. The fourth option we examined was the C-shaped contoured maternity pillow- it comes in white, ivory, burgundy, chocolate, and gray. It's marketed towards expectant mothers who have a difficult time finding a comfortable resting position- the two contoured legs enable them to sleep on either their sides or their back. One buyer endorsed it as an anti-snore pillow because since most snoring occurs when you are sleeping on your back if you are hugging this pillow. Even if you are somewhat rolled over towards a prone sleeping position, you'll be at a diagonal, which will reduce the incidence of snoring, some buyers say. One husband purchased it for his pregnant wife- she tells us that it has reduced her leg and back pain significantly since she began sleeping with it. Some buyers describe feeling like they are in a comfortable nest. The last full body pillow we examined was manufactured by Leacho. It comes in ivory, sage, gray, brown, khaki and mauve colors. 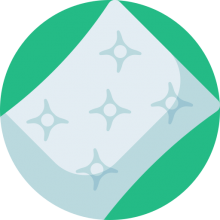 It's marketed towards people that have tons of pillows cluttering their beds and want to consolidate them into one single and dynamic option to support their stomach, neck, back and hips. As well it's also marketed towards pregnant mothers, providing them the stomach support they need during their pregnancies. Indeed, another market that the Snoogle targets are people suffering from chronic pain disorders that affect the hip, the bad, the neck, as well as those dealing with arthritis and fibromyalgia. Some buyers who purchased it told us that it has improved the quality of their sleep which has consequently enhanced their mood during the day- no longer do they feel as depressed or irritable as they used to. Another interesting experience we heard about was that people who are restless sleepers, their partners have benefited from their use of these body-conforming pillows. Essentially they function as a breakwater- a padded damn between the couples that helps divide them and enable both to get a better night's rest- one clutching the pillow, while the other spared getting kicked or kneed in the night. Many husbands band together describing how happy and satisfied they're pregnant wives are using this pillow- it provides them a better quality of sleep, which makes them and consequently their husbands happier in their marriage. Body pillows are renowned for providing complete body support, especially for side sleepers. They are generally large enough to accommodate the full-length of the human body. Or at least from one's head to one's knees. They enable you to have a place to rest your legs, arms, and head comfortably.They do come in a variety of different sizes, so you will definitely have plenty of selection to match how you like to sleep.